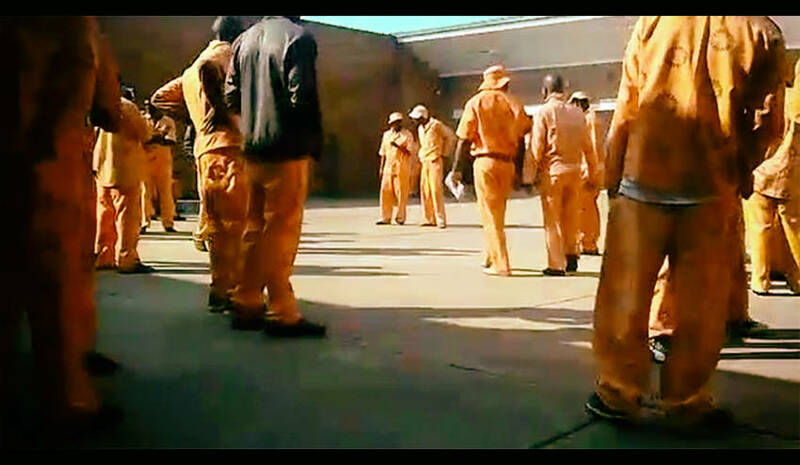 Lawyers for Human Rights (LHR), who are representing inmates involved in the protest, claim that the Department of Correctional Services (DCS) placed nine prisoners in segregation, without observing rules and regulations around the segregation of inmates. The department neither reported this to the Inspecting Judge for Correctional Services, as is legally required, nor observed other rules around the segregation of inmates. Clare Ballard, an attorney for LHR, wrote a letter to the Inspecting Judge for Correctional Services, Judge Johann Van der Westhuizen, alerting him to the assaults and the fact that the inmates hadn’t displayed any violence. The pictures of the injuries beg the question what ‘minimum force’ entails exactly. Two inmates have what looks like a serious head wound, and in one photo there is blood dripping down an inmate’s forehead. Another picture shows a huge bruise on the upper arm of the inmate, spreading out from under his shoulder to just above his elbow. DCS has denied inmates were placed in isolation and rather claimed that the prisoners had been placed in “single cells”. An investigation by JICS confirmed this. The cause of discontent for the concerned inmates is the slow pace of parole applications of lifers convicted before 2004, when the current Correctional Services Act came into effect. That act increased the minimum detention period by another five years, adding to an incremental growth of the minimum detention period for lifers, since 1910. In 1910, the law provided for a 10-year minimum detention period. Offenders sentenced to life after 2004 have to serve a minimum of 25 years before they can apply for parole. Two High Court decisions – the Van Vuuren and the Van Wyk judgments – affect lifers convicted before 2004, when a more lenient parole system was in place. The question which legal regime – pre or post 2004? – applies to their parole bid. The Minister of Justice, Michael Masutha, gave a media briefing about the issue on 29 June in Pretoria. The court ruled in the Van Wyk case that the offenders who were serving life sentences before 1 October 2004 are entitled to be considered for parole in terms of the policy of the department which applied at the date of the commission of the crimes for which they are serving life imprisonment. Lifers convicted before 2004 therefore have a right to the “credit system” that was in place before that date. The credit system meant that the offender would get a certain number of days struck off his or her sentence for every day spent in detention. The two judgments, taken together, mean that the minimum detention period for lifers convicted before 2004 was dramatically reduced. In 2005, and again in 2012, special remissions of sentence were granted by presidents Thabo Mbeki and Jacob Zuma respectively. This advanced the consideration of the minimum detention period for lifers another year. “Lifers convicted before 2004 can apply for parole after 12 years and four months,” the minister concluded. The minister has considered 1,124 parole applications of this group of lifers since he took office in 2014. “Of this group, I have released only 291,” he said. The Minister of Justice decides on all parole applications of lifers. The pre-2004 group of lifers at Kgosi Mampuru, however, feel that their parole profiles are deliberately being ignored. “Offenders serving determinate (a set number of years) sentences have their profiles submitted to the Correctional Supervision and Parole Board (CSPB) in time, whereas those serving life sentences are delayed,” a group of “disgusted lifers” wrote in a memorandum to the minister. For now it seems the disgruntled lifers are taking their frustration to the courts. Several groups of inmates have taken their bid for parole to court. On 25 May, lifers at Westville prison in Durban won their case at the High Court, when the judge ruled that the minister must consider nine lifers for parole and for him to “stop postponing or delaying” the process. Lifers in Mthatha prison in the Eastern Cape have also taken the minister to court. About a hundred inmates from other prisons around the country are also considering legal action. It is probably in the interests of the department to resolve the issue swiftly, as the minister admitted during a recent press briefing in Pretoria that the department is being sued by lifers at least 10 times a week. DCS has set up task teams to deal with the pre-2004 lifers’ parole bids. Lulama Mkgopane is a “pre-2004” lifer incarcerated at St Albans prison in Port Elizabeth. He was sentenced to life in 2002, for an armed robbery that ended in a murder. He has been incarcerated since his arrest in 1998. He was elected to represent 15 other lifers in their negotiations with the Head of Prison. Initially, the group wanted to go on a hunger strike, but then they read about the successful litigation that lifers are pursuing throughout the country. Now Lawyers for Human Rights is assisting them in taking their parole bids to a judge. The frustration among the hundreds of lifers who have a pre-2004 parole claim is mounting. According to Mkgopane, if the court bid is unsuccessful, they will vent their frustrations through other channels.